One of the issues with converting a standard putter to an armlock putter is that it will likely have too little dynamic loft at impact. Ball position is a big factor with an armlock putter, as it will alter your dynamic loft by placing it further back or further forward. You're correct in that it changes the way you address the ball. This is the issue that I'm working with in my own testing. Just due to the forward lean of the shaft, I've found that my eyes do not reveal the line like they do with a conventional putter and I've had to recalibrate my line of sight to adjust for this. I've settled on playing the ball pretty much center of my stance, perhaps a touch behind and being very conscious of my shoulder line. It's easy to open the shoulders at address and I've had to make a conscious effort to ensure that I'm square to my line, otherwise I will miss left. I chose to use a CU5 as it already has a lot of offset and a thin plumbers neck. In addition to lengthening the CU5, I also bent the neck a bit to give me the 7* of loft that a standard Bettinardi armlock has. In order to have my arms in a comfortable position the ball needs to be further back in my stance. It’s still a work in progress. I just wanted to see if it is viable without spending hundreds of dollars. Great starts guys. Common theme definitely seems to be the adjustment period but I'm glad to see you all plan to roll hundreds or thousands of putts over this test period. If nothing else, looks like you'll be getting a ton of practice in. I think I'm the most interested in longer lag putts. 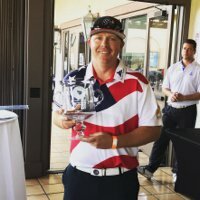 Like many others, I gave the belly putters a try after the Keegan/Dufner shoot outs. The short-ish putts came with practice but I never could get the hang of speed control from distance. At this point, would any of you feel comfortable putting them in play for a league round right now? Yes, for sure. I'm confident that it would at least be "serviceable". My speed control has actually been the biggest improvement so far. I really struggled with consistent strike because of my wrist hinge, and with the armlock, my impact is in the center more. This helps me get more consistent speed with the same length stroke, so I have more faith in the distance I'll get out of a specific stroke. I have put mine in play for one of my competitive group games for 9 holes, then switched to my regular putter because I just wasn't quite comfortable enough with the armlock. I will be using it tomorrow in play. Sadly, my knee surgery is going to interfere with golf significantly and somewhat limit my testing, but I should have enough data before that happens to give a good review. Yeah, to add to my thoughts here, I'm really struggling on shorter putts. I've always struggled with short putts and I've been practicing probably 200-300 3 footers a day. It's really a hit or miss with the short putts. The problem is, it's a two way miss that stems from both setup and stroke. I'm working on it though, and *slowly* improving. I'm the personification of the tortoise in the children's story, The Tortise and the Hare. I think I'm the most interested in longer lag putts. My biggest concern going into this was controlling pace from longer range and initially it was indeed the shakiest aspect for me. But the miss was always short side and after the first couple days (500 putts) I wasn’t having pace problems at any distance. One thing I think has helped me adjust and may also be useful to the rest of the review team is Ben Crenshaw’s method of warming up the putter. The first thing I do on the practice green is spend 5 minutes rolling long putts from one edge to the other in several directions. The only thing I focus on is pace. Not having a hole as the target helps free up my stroke and also gives great overall green speed feedback on any given day. I feel like pressure putting is at the heart of your league gamer question and I wouldn’t mind gaming it in medium pressure situations. How it would actually hold up under those conditions would be a guess at this point but I’m still lacking the trust (read: sufficient experience) necessary to bag it for a big event. Interesting I have had a little different experience. I have been very successful inside 10ft but struggled on long putts. To be fair I haven’t really practiced many long putts with it yet. Great start so far guys!! I've been really curious in arm lock putters for a while now to see what people think. Here are a few questions I've got for you guys. Starting with just the putter head itself, have you noticed a forgiveness level on off-centered hits? Do you notice any difference in the roll versus your current gamers? How many grip positions have you guys tried to get "comfortable"? Have any of you tried actually doing left hand low and locking the grip into your forearm at the top of the grip? For forgiveness, this is not as forgiving as my PING, and definitely not as forgiving as an EVNROLL, although this is to be expected. This putter doesn't have any groove tech built into it, so if you miss the center, the speeds do vary. Honestly with the armlock, I find myself missing the center less, so I'm not as worried about it. It definately puts a more forward end over end roll on the ball than my PING did. I think this has more to do with the proper loft and more upward stroke/strike than anything else. I pretty much started with the "standard" armlock grip right away, it's what I'd seen most people use, and seemed like the easiest transistion. I did try the claw, but as I mentioned earlier, it made my right hand control the face too much. 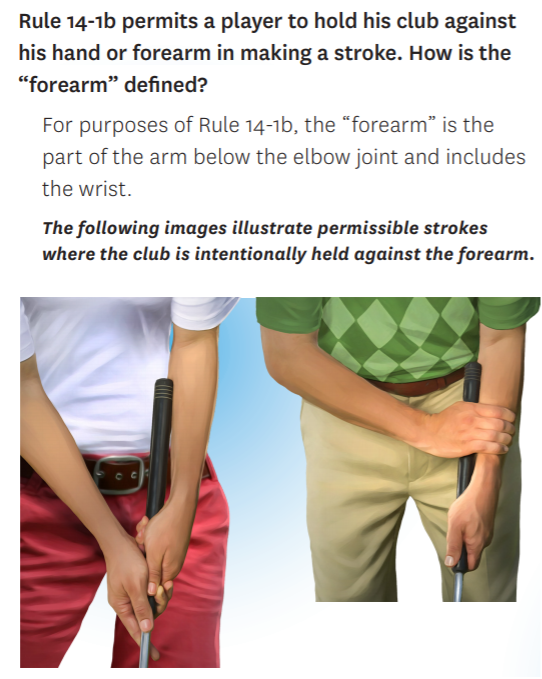 I'm not too sure what you are asking about the left hand low, but having the grip/shaft touching anywhere above the elbow is anchoring and illegal. As long as it isn't touching above the elbow, you could definately try it and it may work for you, but I still think the best two grips are convential and claw. The easiest grips to transistion are definately claw, and conventional, with those, you'd grip the putter the exact same way, just with the shaft up the forearm. I think any other grip (left hand low etc.) would be markedly harder to transistion from. It is taking me a long time to not have it feel weird with the right hand on the bottom. I'd trained myself that left hand low was normal, and then when I switched it, I'm having to retrain my brain all over again. I am assuming that you will address this in your stage 2, but figured I would ask to make sure that you do. In putting, ball position can be important. You all picked you specs based on some fitting approach. How did you go about getting fit for armlock, How much did ball position play into your specs, and if you moved your ball position, do you think it would it be beneficial to change the fitting to match you old ball position? I ask because my ball position is based on how I see the line of the putt. Moving the ball would change what I see and I am not sure I want to make that kind of change. Here's a question I'm wondering about, how's the grip working for you guys? I've always thought the ideal way to armlock would be DeChambeau style with a SS Flatso or the Jumbomax Armlock flat side up the forearm to feel more 'locked in' so to speak. With the more traditional Lamkin is anyone feeling that way yet or are you getting along just fine? This putter rolls the ball very nicely. It seems to start rolling immediately with little skid. Again, I'm finding myself having cleaner strikes on the face. I've tried conventional and a claw grip. Went back to conventional. The grip you describe would result in almost total control of the putter by the left arm, which I did give a shot and found more difficult to keep on a smooth stroke, but I've never liked the left hand low stroke. I'm doing just fine with the standard grip. It rests against my forearm without a lot of pressure. If my hands do get flippy, I immediately feel that as the shaft moves off my forearm. I suppose, like anything, grip would be a personal decision. Looking forward to getting out and playing a competitive round with this putter in the bag this weekend to see how it holds up. That's interesting that the putter is helping you find the center more so you wouldn't really need the forgiveness as much! I really like that! Yeah, I tried the left hand low grip you show and found it very awkward. The way I'm gripping it centers my elbows against my body allowing me to rock my shoulders back and through. With the grip you show, it was all my left side trying to control the stroke. Not saying it can't be done and be effective, but rather it wasn't working for me. But, as I said before, I was never comfortable with a left hand low for anything other than short putts. Maybe some of the other testers are using this method???? My ball position was too far forward to begin with so moving back was a welcome change. I knew I wanted to move my ball position, at least to the middle of my stance, so I ordered a putter with more loft. This allowed me to use more forward press, which I really like doing. You could definately order specs that wouldn't require you to change you ball position, you'd just need a fitting. Since I was going in as a blank slate with no tendencies with the armlock technique, I'd just figure it out as I went. A fitting when I had no clue how to even hold an armlock putter just seemed like a waste of time. I have no problems with the Lamkin, I do think if I was building from scratch, I'd go with the JumboMax, it seems like it would "lock" the best. I do wish the Lamkin was an inch or 2 longer, it just seems like it should come a little farther up your forearm. Ahh, I gotcha now. I just tried it out inside, and it feels ridiculous to be honest. I'm not saying it couldn't work for you, it just doesn't work for me. And that is coming from a previously left hand low putter. I'd recommend it if you want to completely take you right hand out of it, and just use your left arm. I don't expect the left hand low grip to catch on, you might see it once in a blue moon. My current grip is the one on the left, with my right hand overlapped a little more over the left. I self fitted myself for this putter. I took a regular putter, then measured up my arm to get the distance. I was afraid of going too long so I ultimately settled on the standard length (in retrospect, bad, but not fatal, choice). As long as I went standard length, I also didn't change the lie. For the loft, I did consider my ball position. I tend to play my ball at my sternum +- an inch. Given that I knew this would forward press the shaft, I wanted a bit more loft to ensure that I had a dynamic loft near 3-4 degrees. I went with 7 degree (standard is 5). Now, regarding ball position, I have played it forward, back, and center and found the best results center with my eyes just inside the ball rather than directly over it. For me, this allows me better control of the rocking of my arms as I can lock my arms along the sides of my body for stability. It's been a trial and error approach, but it's becoming more and more comfortable and reliable.